For the second year in a row, I served as the lead trainer and coach for the Liberty Hill Foundation’s Wally Marks Leadership Institute Board Development Track. 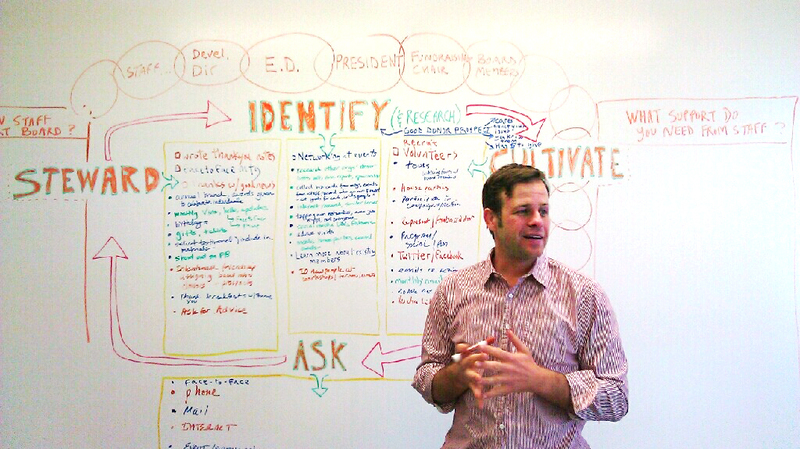 I led a two-day Board Development training focusing on how to engage a Board of Directors in the fundraising process. Staff and Board from three organizations attended this training, along with two other coaches in addition to me. We covered six important steps to move a board towards fundraising and also reviewed four fundraising policies in detail. What made the training truly engaging besides the multiple exercises and role-playing I led, was the amount of time each group spent with their coaches to take the best practices they learned and apply them to their own organization. I also loved using Liberty Hill’s wall covered with “Idea Paint”, turning it into an entire white board. Through this process, each organization developed specific goals they want to work on that will lead to processes that ultimately strengthen their Boards and organization. Each coach will meet regularly over the next six months to support these organizations as they move forward. One reason why I loved leading this training so much is because it combined the three things I love doing for nonprofits into one event: training, facilitation and coaching. As a trainer, I presented on best practices. As a facilitator, I led several different discussions where mutual learning took place. As a coach, I listened closely to the leadership of one of the organizations and supported them as they developed a strategy for moving forward (I’m thrilled to coach East Yard Communities for Environmental Justice this year!). I’m most impressed with Liberty Hill’s Commitment to its grantees through this comprehensive leadership development program and encourage any social-change oriented organization in Los Angeles to check them out. This entry was posted in Board Development, Facilitation, Fundraising, My Clients, Training and tagged #Nonprofit, Board Development, boards, Clients, Coaching, Facilitation, Fundraising, Training. Bookmark the permalink.